Performs such as pomade, with extreme hold and fragrance of vanilla. Hair can naturally be a model on faux hawk and stays strong until end of the day. 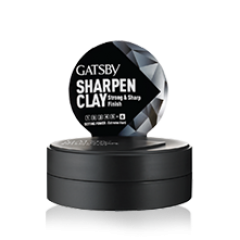 We highly recommend Gatsby Sharpen Clay for a solid and heavy hold pomade. Hair styling products with high power holding that can form a Cool hair style with characteristic Sharp Pre-arranged &, Loose, and Volumizing & persist throughout the day.